Russia is famous not only for its authentic Vodka, but also its rich culture and deep root of history. The country’s literature is well known and highly respected world-wide. Leo Tolstoy and Dostoevsky are among the most famous writers from Russia. Their ballet has also traveled and performed globally. Speaking of literature and performance all at once, though, there is a festival in Russia that is always awaited by theatre and play anthusiasts around the world. Let us see now 7 famous things about Chekhov International Theatre Festival. Anton Chekhov is one of Russia’s most famous writers of playwright and short stories. He died in 1904 and has produced four plays in his lifetime, all which were said to be the beginning of Russia’s modern theatrical performance. For this reason, his name was the one chosen to fly the flag of this international event. Chekhov International Theatre Festival was founded by the International Confederation of Theatre Associations with Kirill Lavrov as the president at that time. The first event was held in Moscow during the fall of 1992. The idea of establishing the festival was to introduce international productions to theatre enthusiasts in Russia while hosting an event for the people in the industry to gather, meet, and exchange ideas. The first festival had eleven productions from nine countries. The festival is held every two years except for the first and second ones because there were four years of gaps between the two. The fourt event was three years away from the third because the organizers wanted to have it together with the Theatre Olympics in 2001. The number of participants and performances grew bigger and bigger each time, the list on the playbill grew longer too naturally. The festival then divided into three parts; World Series, Moscow Series, and Regional Program – the whole event could take more than two months in total which definitely became a high time for play, theatre, and art lovers around the world. This year Moscow will host the 14th Chekhov International Theatre Festival. There will be 73 shows spread in 22 theatres all over Russia including St. Petersburg. Not only theatrical performances, there will also be opera, pantomime, ballet, modern dance, punk-cabaret, seminars, exhibitions, and many more. The participating countries will include China, France, Japan, Germany, Brazil, Canada, UK, and more. Ten languages will be used across the performances. So you can imagine how grand the festival is everytime it is carried out. For theatregoers, the event is definitely a bliss. In 2007, a public foundation was established to support and assist the Chekhov International Theatre Festival by a group of international artists. This was done particularly to make the Regional Program happen succesfully. This fund has helped a lot with carrying out the longest playbill in 2013. The artists who are collected in The Foundation also performed their own play during the event which made the organization even more special. The President is Declan Donnellan from Great Britain, and in one of his speeches about the cause of the fund he mentioned that The Foundation was established in order to make possible the best performances from around the world to be enjoyed by the public and, moreover, to “educate” people who love art and performance more about the diversity of the theatre around the globe. More buildings are spread in many other cities around Russia, well prepared for the international theatre festival. To honor the man whose name is holding up the flag of the festival, every year they would perform one of the plays written by Chekhov; The Seagull, Three Sisters, Uncle Vanya, and The Cherry Orchard. Some of the international theatre groups even use the title of the plays as the name of their groups. 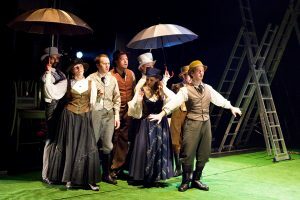 In 2010, together with the 150th anniversary of Anton Chekhov, the 9th International Theatre Festival in Moscow carried out a theme of ‘after Chekhov, about Chekhov, to Checkhov’ for a production dedicated to the important man of Russia’s history of theatre. This production was arranged together by the Festival, Russian, and some foreign directors and theatres. On the festival’s official website, you can find the map to all the theatre buildings that host performances during the event. Very easy to integrate with the online map you usually use on your smartphone. Also, you can download the playbill and save it on your phone making it paperless and easier to check. The ticket section is also available on the website. You can check the price, the seatings, the schedule and arrange which ones to book. Very convenience, easy to navigate and user friendly. Some of the texts are still in Russian, though. Those are the 7 famous things about Checkhov International Theatre Festival you need to know. Very interesting facts that surely make you want to try and visit. Even if you are not much of a theatregoer, but checking out the playbill and learn more intensively about each of the performances might intrigue you to watch if you happen to be in Russia around mid May to July this year.